New Delhi: The Vice President of India, Shri M. Venkaiah Naidu has appealed the officers of Indian Postal Service to re-design and strengthen the rural postal network to make it a distribution and logistics hub. He was interacting with the Probationers of Indian Postal Service of Rafi Ahmed Kidwai National Postal Academy, here today. 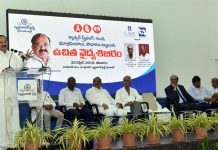 The Vice President said that feel proud to be part of India’s oldest and widest service network and the post offices with their widest network of branches can execute the challenge of Financial Inclusion, especially among the weaker sections of the society by providing Postal savings schemes and insurance schemes. He called on the officers to be agents of change by transforming lives of people living in rural areas. The rural Post office can become an ICT centre and Retail Centre, thus bringing enormous benefits to the rural populace, he added. The Vice President said that post offices play crucial role in providing communication services to people living in rural areas. He further said that they act as a linkage between rural and urban areas. Postman is the first man to reach the last man and it is the finest service that helps the last man in remote areas, he added. The Vice President advised the officers to be innovative in their ideas to provide world class services to Indian population. He further said that services like online selling of Postage Stamps, distribution of Ganga Jal, Post Office Passport Seva Kendra and Aadhar Enrolment and Updation Centres ensured convenience to the people. Always keep on identifying new areas where the post office can make the difference in quality of service, he added.